The Superlight is available in both S3 and SV chassis sizes. The list of standard equipment reflects the Superlight’s bias to track work: wide-track front suspension, 6 speed gearbox, carbon fibre dashboard and front wings, GRP aeroscreen and seats, racing harness, removable steering wheel. Quoted weight for the Superlight is about 50 kg (110 lb) less than the Roadsport, due in part to the lack of a spare wheel and carrier. Engine options include the Ford Sigma (150 bhp (110 kW)) for the R300, whilst both the R400 (210 bhp (160 kW)) and R500 (263 bhp (196 kW)) use the 2 litre variant of Ford Cosworth Duratec engine. 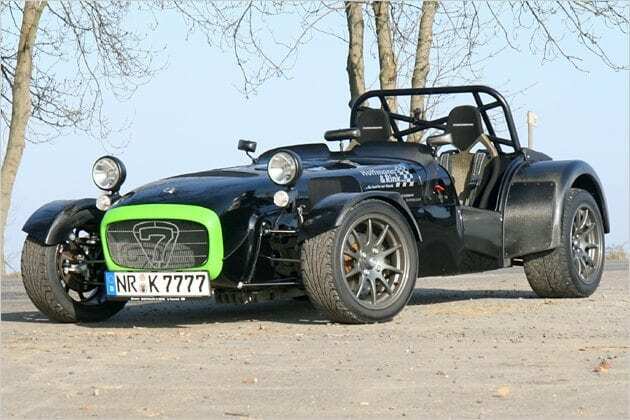 With the launch of the R500 (April 2008), Caterham made available the options of a sequential gearbox and launch control. Quoted performance for the R500 is 0-60 in 2.88 seconds and a top speed of 150 mph (240 km/h). In October 2012 a supercharged model (‘R600’) for a race-series above the R300-class was released, including slick tyres and a sequential gearbox. At the beginning of December 2008, the R500 was featured on the popular BBC television show Top Gear, putting in a timed lap of the Top Gear circuit of 1 minute 17.9 seconds. This is, to date, the eleventh fastest official lap timed by the show, faster than, amongst others, the Bugatti Veyron. This feat was considered even more impressive due to the coldness of the conditions which made it difficult for the test driver (The Stig) to get heat into the tyres. Shortly afterwards, on 14 December show, Top Gear made the R500 its ‘2008 Car of the Year‘.